​See renovation dreams become reality! We are thrilled to announce a runner-up prize for an entire house remodel! This one is especially dear to us, as it is our own home! We did considerable work inside and out, and the photos just barely do it justice. 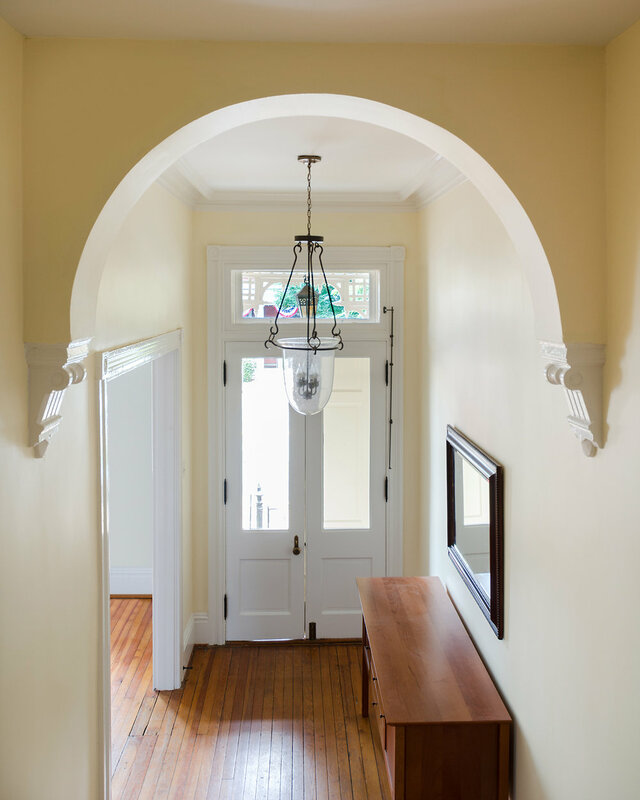 As this home is over 100 years old, we had a lot of careful deconstruction, and thoughtful reconstruction to maintain the vintage appeal and appearance, while still meeting modern standards of safety and convenience. This bay window was completely deconstructed and re-built. All the trim was milled on-site. Ahhhh - Home Sweet Home! COTY Award winning Bathroom remodel! We are thrilled to announce another COTY award winning remodel! This bathroom was built quite simply, with contractor-grade materials. Our remodel provided an edgy and modern spin, with luxury materials and fixtures. The walk-in shower has Low-Iron glass, which appears gray-er than regular glass, to better compliment the gray tones of the rest of the room. The zinc-clad console and cabinet keep the monochromatic look as well. We are thrilled to show you the interor remodel that garnered us our 3rd COTY award! This first floor remodel included a kitchen and powder room. This gorgeous Fan home had been renovated before. The floorplan and flow had been changed quite drastically. We removed the obstacles and restored the original flow to the first floor, and enlarged and enhanced the kitchen. The result is stunning! The new kitchen enjoys an open floorplan with a family room. Materials were re-used and re-claimed whenever possible. Even plugs in the floor were carefully selected for the best possible grain match. We were lucky to locate pocket door tracks in the ceiling, and the homeowner chose to include them in the renovation. We located doors and the rest of the track hardware at a reclamation yard, and after a few modifications, have gorgeous, working pocket doors! The fireplace surround in the dining room is original to the home. It had many layers of paint, and we initially planned to apply a marble faux-finish, but upon cleaning, we discovered a lovely slate surround. It even has faint pencil marks from the craftsman who carved it! The powder room is tucked neatly beneath the grand staircase. It is an effective use of space. The exposed brick and gold paint make this room a warm and lovely surprise amidst the crisp white trim of the hallway. Haines Construction - A full-service renovation specialist and builder. Building and renovating for 20 years in the greater Richmond, Virginia area, Haines Construction can take your renovation and home-building dreams to reality.